MMS TRIVIA NIGHT: Our largest fundraiser of the year is all sold out and we’re ready to party! A huge thank you to the Vanessa Pollock Realty Team for so generously helping to fund our event, to the Maplewood Grille for providing their delicious food at cost, and to Laura Himmelein of Party Cake Party Cake for working her decorating magic. Check your email this week for more info about the night. Can’t wait to see so many of you there! 8TH GRADE MIXER WITH SOMS: The MMS/SOMS mixer is this Thursday, February 2nd at CHS. Don’t let your 8th grader miss all the fun! Tickets will be sold during lunch this week -- click HERE for the permission slip and all the info. And parents, are you able to help out? Please click HERE for the Sign Up Genius to donate snacks or your time. Thank you! TABLE TENNIS TOURNAMENT: The 8th grade table tennis tournament fundraiser is this Friday, February 3rd from 1:45pm-3:05pm in the gym. Will be a really fun event for all students & staff! MLK CLUB SOCK DRIVE: Please encourage your students to participate in the MLK Club Sock Drive to benefit Covenant House of NJ, a nonprofit charity which serves homeless youth. Mens Large are the most requested size, but the organization would be grateful for any donations. Collection boxes have been set up throughout the school. Thank you! SPECIAL EDUCATION MEETING: The next SEPAC meeting is Wednesday, February 1st at 7:30pm in the CHS Black Box Theatre. GUEST SPEAKER #1: Penny Petchers, SOMSD’s Behavior Management Consultant, will discuss her role in the district and provide behavioral strategies for school and home. GUEST SPEAKER #2 – Introduction of Mr. David Lieberman, SOMSD’s Interim Director of Special Services. 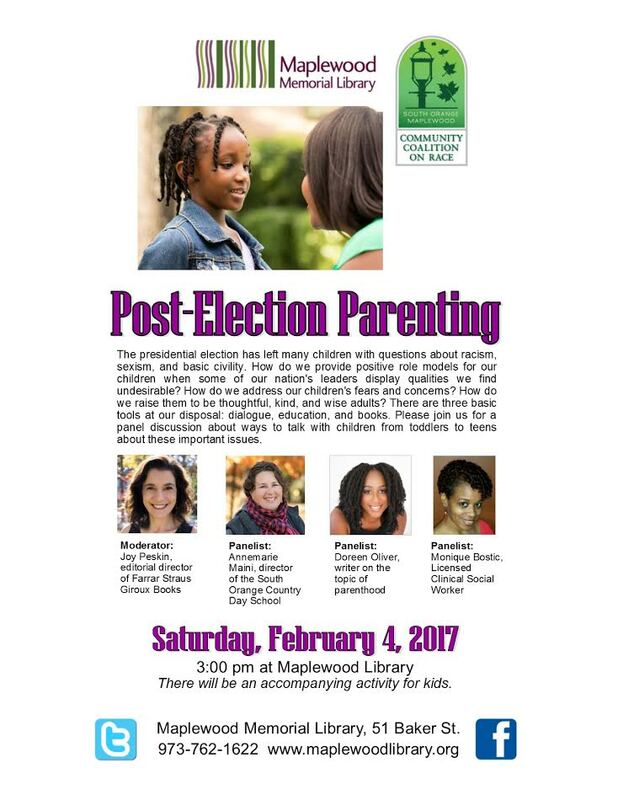 POST-ELECTION PARENTING: The Community Coalition on Race is hosting a panel discussion about ways to talk to children and teens about the many issues that are arising in our communities and in our nation since the US Presidential Election. The event will be held on Saturday, February 4th at 3pm at the Maplewood Library. Please click HERE for all of the information. WINE TASTING FUNDRAISER FOR CHS FENCING: Please click HERE for information on a wine tasting fundraiser to benefit the CHS Fencing team, held on Friday, February 10th at Orange Lawn. ​MMS YEARBOOKS: The MMS Yearbook sale is ongoing. The yearbook is organized by MMS teachers Ms. Hansen (mhansen@somsd.k12.nj.us) and Ms. Varney (rvarney@somsd.k12.nj.us), who can be contacted with any questions. The flyer outlining how to order online or in school can be found HERE. And information on purchasing a “Well Wisher” for an 8th grade student to include in the yearbook can be found HERE.